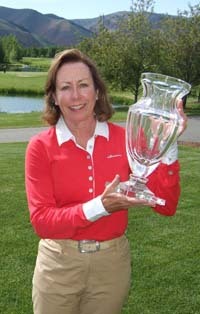 Valley Club women’s stroke play champion Marilyn Celano. Like the rest of southern Idaho, The Valley Club tangled with the cold and wet weather Saturday but still managed to push through and finish its 2012 President's Cup golf tournament to determine this year's stroke-play champions. They are Carmen Bradley for the men and Marilyn Celano for the women. About 40 golfers took part in the 36-hole tournament that was plagued Saturday by cold temperatures and eventually hail and snow. Although the snow accumulated enough to suspend women's play Saturday, more cooperative weather Sunday enabled the golfers to finish their rounds in sunny and more comfortable conditions. Past club champion Bradley won Men's Championship Flight gross with scores of 79-83 for 162 over runner-up Albert King, 84-83 for 167. Women's winner Celano (83-82 for 165) placed ahead of runner-up Britt Palmedo (88-83 for 171). Other gross winners in flights were Mike O'Neil and John Ashton, and runner-up golfers in gross were Chris Stephens and Roger Brown. Net winners were Ryan Stavros, Richard Shelton, Tullio Celano and Kristen O'Reilly. Second places in net went to Rico Albright, Jerry Boas, Jerry Mells, Joan O'Neil and Bev Jaeger. ( Men's Championship Flight—Gross: 1—Carmen Bradley 79-83 for 162. 2—Albert King 84-83 for 167. Net: 1—Ryan Stavros 76-78 for 154. 2—Rico Albright 81-77 for 158. ( Women's Division—Gross: 1—Marilyn Celano 83-82 for 165. 2—Britt Palmedo 88-83 for 171. Net: 1—Kristen O'Reilly 76-80 for 156. 2 (tie)—Joan O'Neil 83-76 for 159, and Bev Jaeger 78-81 for 159. ( Men's First Flight—Gross: 1—Mike O'Neil 87-84 for 171. 2—Chris Stephens 88-90 for 178. Net: 1—Richard Shelton 72-73 for 145. 2—Jerry Boas 77-80 for 157. ( Men's Second Flight—Gross: 1—John Ashton 88-96 for 184. 2—Roger Brown 93-96 for 189. Net: 1—Tullio Celano 72-71 for 143. 2—Jerry Mells 74-74 for 148.